Nyerimilang Heritage Park is on the shores of the Gippsland Lakes, 10 km by road north-west of Lakes Entrance. 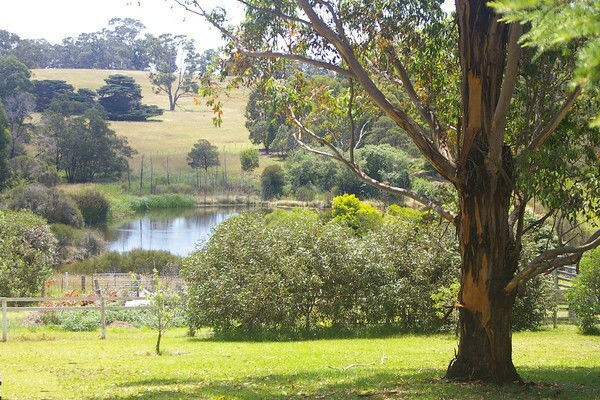 The park is ideal for picnics featuring attractive gardens and pastoral surroundings and walks along bush and farm tracks. The park also offers magnificent views across Reeve Channel and the lakes beyond. Nyerimilang is used by local community groups for activities concerned with history and the natural environment. These events are advertised locally and are generally open to all park visitors. Whistling Kite Track (0.75 km - 10 mins one way): after a grassland walk, the track passes through various forest types. The Whistling Kite, a large brown hawk, nests in the tall Blue Gums that surround this short walk. Homestead Track (1.1 km - 25 mins one way): the original entrance to Nyerimilang Homestead was via this track from Maringa Creek crossing. Leaving the homestead, the track gently descends through moist gully vegetation to swamp, then salt marsh. Cliff Top Walk: affords the visitor panoramic views of the nearby lake system and Bass Strait beyond. The meandering, mostly level track is 1.7 km, 30 minutes one way. Kurrajong Track (0.75 km - 10 mins one way): this track is a link between Cliff Top and Homestead tracks. The Kurrajong, an evergreen native tree, is most obvious on the northern end of this track. Salt Marsh Track (1.2 km - 25 mins one way): the track is from the Kalimna West road to Reeve Channel. The salt marsh environment surrounding the tidal Maringa Creek gives way to the sandy shoreline of the lake system. Bird Hide Track (0.4 km - 5 mins one way): commences at the intersection of Cliff Top Walk and Salt Marsh Track. A pleasant resting point to view the wildlife of the salt marsh. In the grounds of the homestead there are picnic tables and toilets, with facilities for the disabled. Souvenirs and tourist information are available in the Friends of Nyerimilang shop at the Park entrance. Camping is not permitted, but a wide range of accommodation is available in Lakes Entrance, Metung and Bairnsdale. The land that is now Nyerimilang Heritage Park was first owned by Mr A Murray in 1884. He later transferred it to Frank Stuart of Melbourne who built a home as a base for fishing and shooting holidays at the Gippsland Lakes. During the early 1930s, his son Frank Jnr extended the house, developed the surrounding gardens and lived in style at Nyerimilang complete with housemaids and a gardener. When Frank Stuart Jnr died in 1936 his widow gave the property to the Anglican Diocese of Gippsland for use as a Boys' Training Farm. William Buckland, the "quiet millionaire", purchased Nyerimilang in the 1940s and occasionally used it as a holiday home. After he died in 1964 the property changed hands again before being purchased by the Victorian Government in 1976. A display featuring the history of Nyerimilang and the natural resources and history of the Gippsland Lakes may be seen in the homestead. A collection of reference material is also available in the homestead library. Nyerimilang attracts many species of birds including honeyeaters, water birds and birds of prey. A large dam below the homestead provides a new habitat of wildlife in the Park. The semi-formal gardens and lawns surrounding the homestead contain an interesting collection of exotic and native species. Elsewhere, the majestic Gippsland Blue Gums and Coast Grey Box on the cliff tops contrast with the marshland in the valley of Maringa Creek. The East Gippsland Garden will represent the flora communities of East Gippsland. The garden is currently being developed by the Friends of Nyerimilang, Society for Growing Australian Plants- Bairnsdale Group and Parks Victoria. Native plants and animals and historic features are protected. Leave the park as you find it. Access to Nyerimilang Heritage Park is from the Princes Highway via either the Nungurner Road or the Metung-Kalimna West Road. Signs indicate the appropriate turnoffs from the highway to the park. The park is open daily until sunset and the homestead is open when Rangers are on duty, normally from 9:00 AM to 4:00 PM. Group visits should be arranged in advance with the Rangers.